New York, February 22, 2011 — Global Finance announces its selection of the World's Best Investment Banks 2011 to be published in its April 2011 issue. 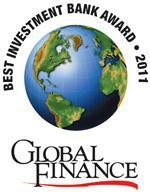 Global Finance editors, with input from industry experts, used a series of criteria to arrive at their selections. These included market share, number and size of deals, service and advice, structuring capabilities, distribution network, efforts to address market conditions, innovation, pricing, after-market performance of underwritings and market reputation. Deals announced or completed in 2010 were considered. "The investment banking industry has changed as a result of the financial crisis," said Global Finance publisher Joseph D. Giarraputo. "The best institutions are those that have a business model focused on customer needs."